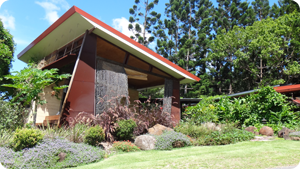 Come and stay with us in the green hills of the The Eco village in the Currumbin Valley. This sustainable community has won over 30 awards, and received the prestigious international award ‘The worlds best environmental development’ in 2008 from Prix d’excellence Association. Another award the ecovillage is proud of is for it’s Gold Coast Urban Design Award for Built Environment. As quoted by Elizabeth Watson Brown, Architect and chief judge for the awards: This is an award for innovation, bravery, inspiration and setting the highest benchmark - about signaling and guiding the future”. If you’re interested in staying in an eco friendly home and wanting to see how amazing it is, come and be our guests for a night. You'll get an extended stay to see all that the village has to offer. Filtered rainwater for drinking. Tea and coffee facilities in room and snacks. Swim in the community pool. A large salt and eco chlorinator maintains constant clarity. Pushbike ride around the ecovillage and chat to some of the residents. Walk to the village cafe, open all weekend. Enjoy a cuppa or lunch in peaceful surrounds while reading the paper. Talk to the friendly guests. Enjoy the open space, peace and fresh air of the valley. Find out about it’s history, visit the Old dairy community facilities. Walk up to the Highlands, the last stage of the community. Tall pines and cool walkways await in a totally different ecosystem of this area. Take a stroll past the creek and the lake nearby. Drive up to the Currumbin rockpools or to Mt Cougall National Park for a walk amongst waterfalls and rainforest. Take a dip in the rock pools in summer and be totally refreshed. Drive to the Currumbin Beach, only a 10 minute drive away. See the kangaroos living naturally in their family groups as they wander all over the village grasslands. Watch for birdlife, we have identified over 150 species on the property. Relax and unwind after your massage. Stroll to the eco village library and borrow a book or magazine to read. Enjoy a Far Infrared Sauna session and feel the relaxation and calmness heat therapy can bring. Vegan and delicious. Amazing gourmet meals, organic and filled with love. This food will blow your mind.